Shorter development session this week, so I concentrated on some smaller items. I’ve put together a new desk for the reception area – previously it was just a wooden table used in the janitor’s room but now it’s a nice shiny, curvy, desk suitable for the reception. Walking around the reception I still got the feeling that it was too large so I’ve remodelled the front of the building again making things tighter and it’s looking much better now. 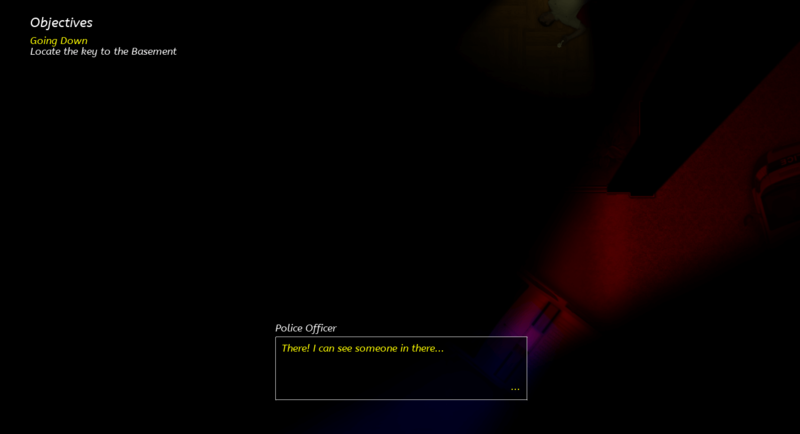 I think that because the area is devoid of lighting (excluding the police lights) and the player can’t see all that far it gives the impression that the room is a lot larger than it actually is. Doors, or rather, locked doors can now trigger quests such as the basement door being locked requiring the player to locate the key. This had a knock-on effect of breaking other doors so I needed to add some additional checks to ensure that bug was quickly squashed. The transition points that I use when the player moves between floors have been repositioned so they are above the stairs rather than on them; I think this helps with reorienting the player. My apologies for such a dark screenshot this week. It’s difficult to grab a shot with the police lights just in the right spot. I will probably add some additional lighting to this area for next time. The Police cars would probably have their headlights on as well as the red-blue lights.